ET Rustro is Responsive Joomla! template that targets for Bars, Cafe, Restaurants websites and any site related to food industry. ET Rustro is specially designed and coded for the restaurant business. Our easily customized slideshows will immerse your customer in beautiful pictures of your culinary creations. Easily create multiple pages to display pictures and descriptions of your specialty dishes. Smooth scrolling customizable menus make it easy for your customers to navigate to your latest mouth-watering masterpiece. Colors are used to blend your website with your cuisine. A coffee shop website may use a lot of dark brown to blend in with the rich dark brown coffee that you serve. If you are serving spaghetti, you may want to use a red color to blend with the tomato sauce. This further immerses the customer in your exquisite food, so they begin to taste it. These Bars, Cafe, Restaurants Joomla! Templates turn out to be a good background for the successful project. 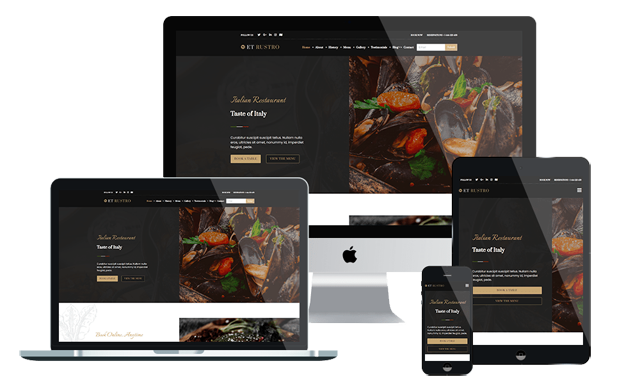 It builds for Restaurants Joomla! Templates area with 100% responsive layout (support for mobile devices), unique and flexible. The template framework supports page builder, mega menu, unlimited position layout and multi-language. Furthermore, we also provide flexible homepage which includes boxed and full-width layout and 4 color styles. Our Restaurants Joomla! Templates are easy to download, understand and customize. Also, Restaurants Joomla! Templates use the latest web standards so your visitors will have a great experience.